Great things come with dedicating your career to medicine, from the reward of improving the lives of thousands of people to the increasingly accelerated advancements in technology and pharmaceuticals. Retiring physicians will agree, and it is because of their invaluable experience and advice that we can give you a heads up to help you live a fulfilling and profitable career. Even though your retiring colleagues won’t get to practice with future breakthroughs, they couldn’t be happier about not having to do so with unpredictable healthcare reforms that could rattle the entire industry. Whether it’s some form of Obamacare or Trumpcare, the new President is expected to make healthcare one of his top agenda items. Yet there is an element that has impacted the industry much more and for much longer than any healthcare reform: the rise of corporate healthcare. Veteran physicians witnessed how the system underwent a slow but prominent overhaul, led by corporations designed to funnel entire towns into their hospitals. They successfully acquired small group practices and hired most individual physicians in the area, using with a wide range of incentives, featuring fan-favorite: not having to run a business. Today, health networks control approximately two thirds of the physician workforce in America, and it’s hardly a coincidence that we’ve seen an increased number of early retirements and physician burnout. These large organizations set a high bar on patient quotas along with tighter policies and heavier paperwork. We’ll give you a few tips on how to avoid burnout at the end of this post. AAFP Insurance Blog: Should I Go Independent? So, regardless of what piece of the pie you belong to, there are certain things that any young doctor can do to start their journey with their best foot forward. Not every physician can retire with a 100-foot yacht, but by creating good financial habits you will likely do so without having to cut back during your golden years. You’ll need to develop and practice good habits, like talking to a financial advisor. Earning more money could mean more problems if you have bad money habits. There are plenty of bankrupt lottery winners out there. Start saving even with what you consider little income, while in med school or during your post graduate year. Dollars invested today will work longer for you, so even if you’re a first year med student (MS1) earning less than $50,000 a year, you’ll see those dollars yield great results 10 years into the future. Take advantage of low tax brackets while you can. Invest the dollars you make in your first year of med school in post-tax vehicles, such as a Roth IRA. You’ll miss those tax savings as you earn more down the line. Also remember, you’ll need to find a life insurance plan that suits your needs as you move forward to the future. We can help you find a flexible policy that can grow with you throughout your entire career. Learn more. 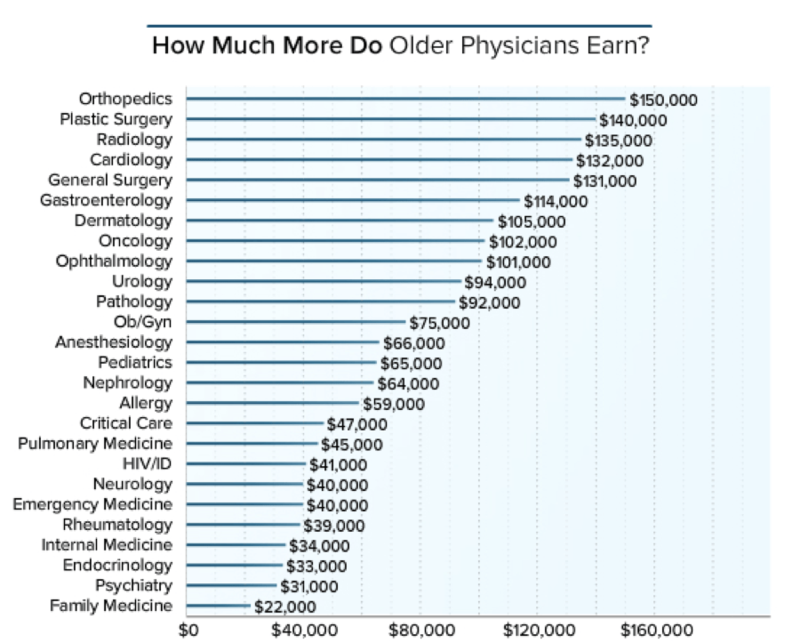 Medscape recently surveyed nearly 20,000 physicians in over 26 specialties on their compensation, with over 4,000 being under 40 years old. 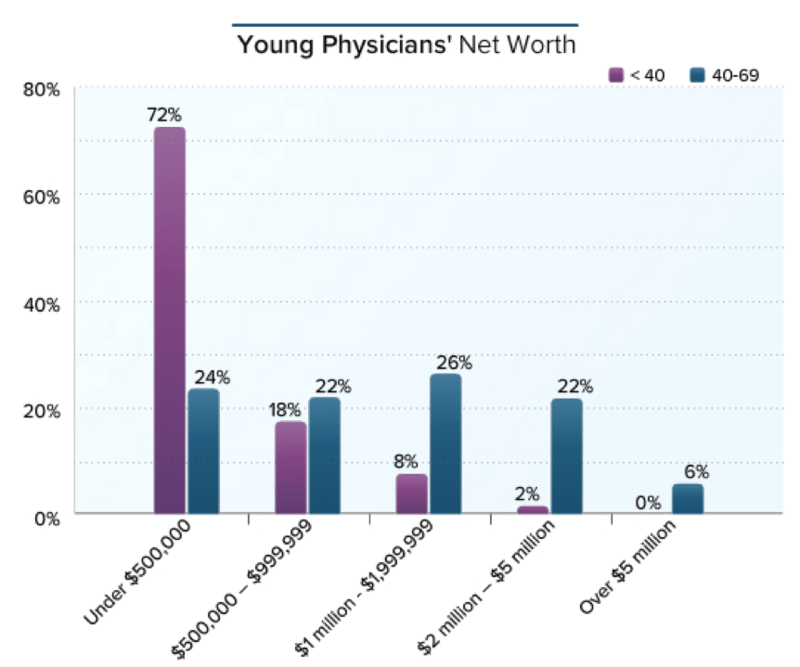 The study explores how incomes vary between younger and older physicians. The figures above include salary, bonus, and profit-sharing contributions. For partners, this includes earnings after taxes and deductible business expenses, but before income tax. 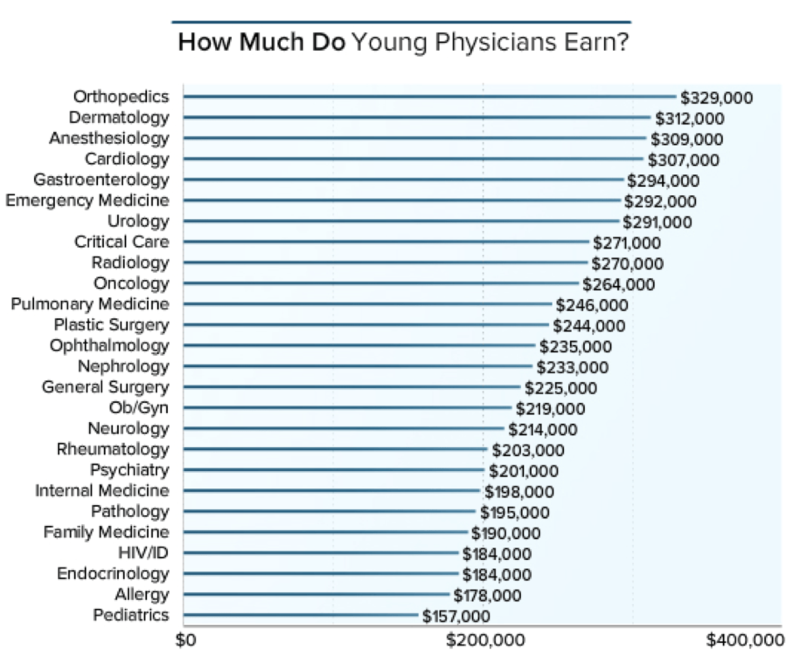 Both younger and older orthopedists rank first, and the difference in income between the two age groups ($150,000) is also the most notable. The smallest difference in compensation occurred in family medicine ($22,000), psychiatry ($31,000), endocrinology ($33,000), and internal medicine ($34,000). Medscape revealed current trends that suggest that the relatively small difference in income between younger and older primary care physicians may reflect recent incentives to entice residents to pursue a generalist path. 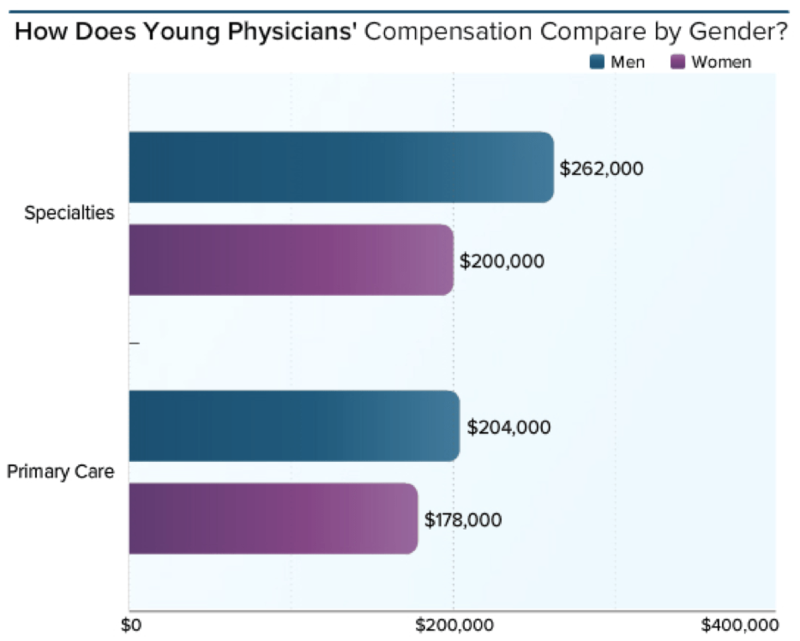 Unfortunately, there are still significant income disparities between male and female doctors. Among younger primary care physicians, women are averaging $26,000 less than men per year, and there’s a bigger gap among young specialists, $62,000 approximately. Part of the reason was exposed in a 2011 study on gender differences, which revealed that young female doctors might be more likely to seek employment trade-offs that favor family considerations at the expense of lower compensation. In the net worth category, Medscape asked doctors to total their assets (including bank and retirement accounts, investments, home equity, and valuable personal property) and subtract their liabilities (including mortgages, home equity and student loans, and credit card debt). A large physician survey conducted by a major investment firm found that most physicians are able to save between 9%-20% of their annual incomes, far better than the average American, who saves 5.4% of his or her disposable income, according to the US Commerce Department’s Bureau of Economic Analysis. 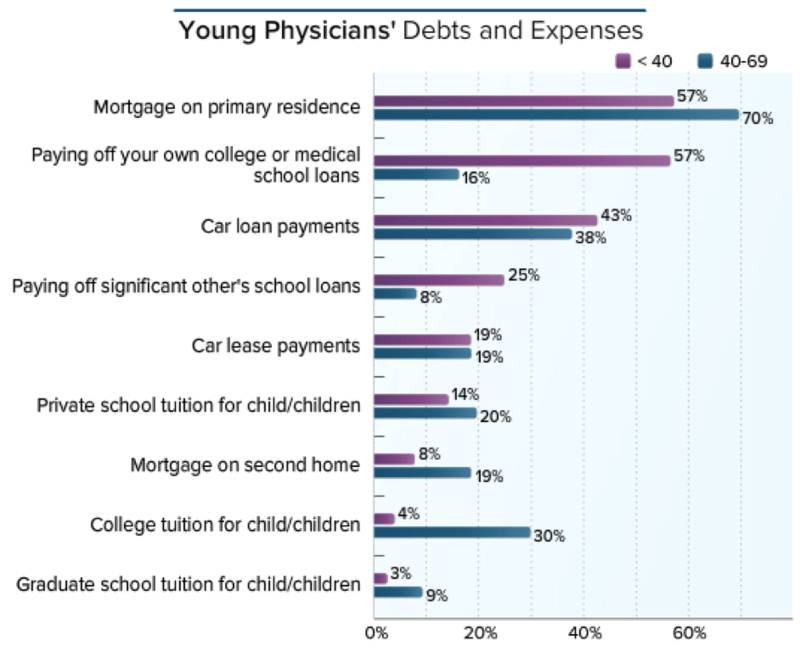 57% percent of younger physicians are dealing with both mortgage and school debts—Shocker. 25% are also paying off the school loans of their significant others. Student loan debt is sometimes accompanied by sky-high interest rates, and in some cases with little opportunity to refinance. You’re a health provider, so start with yourself. Even though you want to hit the ground running and start earning as much as possible, you won’t be able to do so without energy or sense of wellbeing. Don’t fall into the trap of taking on too much overtime when you start seeing juicier paychecks for the first time. You need to give it your 100%, but anything over that will cause a slow but steady increase in stress, the main reason that sends doctors to early retirement. Exercise, spend time with your loved ones and enjoy a healthy work-life balance. Find a mentor. Your colleagues were new grads once, too. If there’s a physician you look up to, ask for their advice and lean on them during your first years out of residency; you’ll save yourself a lot of questions and regrets. Tell us, did you sacrifice earning a higher income for the privilege to take care of your patients?